I’m in Houston visiting the in-laws and even in the winter it is a lot more humid than dry dusty Lubbock. We had two dust storms in Lubbock within a week just prior to Christmas. That’s how dry it is in Lubbock, the north wind just picks the dirt off the cotton fields and blows it into town. 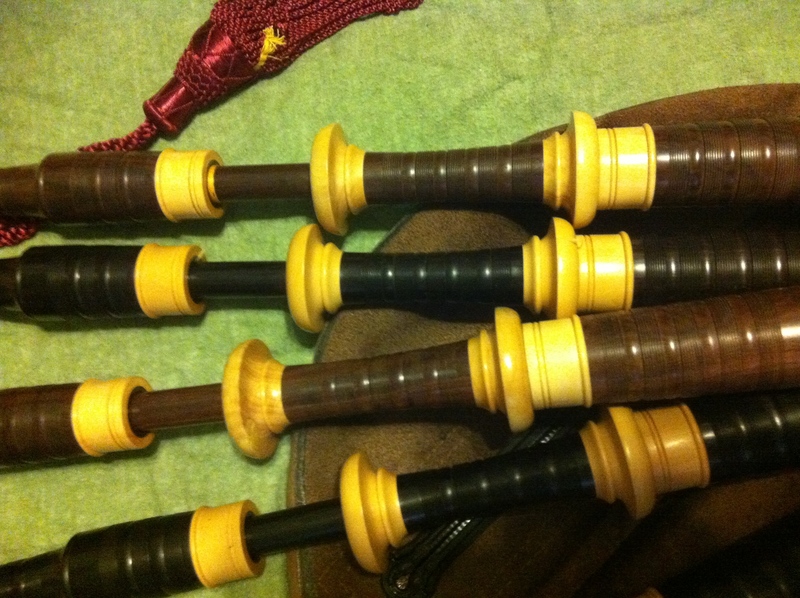 So, I brought my Jeffers pipes along with me with the Atherton chanter and my old crowing Gilmour with 3 corners missing. As usual, the chanter reed needs to be seated deeper into the reed seat when it is humid because the first thing I had to do was take all the tape off the high G AND push the reed in, relative to where the reed seats in Lubbock. You’ll find in the YouTube videos linked below that I’m constantly fighting not only the crow of the high A (this reed always does that regardless of where I am), but a flat high G, despite the fact that in Lubbock I need 1/3 of the hole covered to get it in tune. It would really seem that a lot of chanters (and chanter reeds) are designed and manufactured in humid environments and subsequently they behave very differently in dry environments. One of my important tests for a chanter is whether it squeals on low A with G grace notes. A lot of people attribute this problem to just having a dry reed, and that can be the cause. However, when you live in a place like Lubbock where your reed is going to be dry regardless of what you do, you have to have a chanter and reed combo that never squeals. Some don’t squeal until you start applying tape to the high G hole. In my experience, Dunbar and Shepherd chanters always do this (current humidity in both locations where these two companies are located is in the 80%’s, Lubbock is at 24%). Perhaps they’re manufactured and tested in environments where the humidity changes the setup enough so that the chanter reed is already moist and the high G never requires tape. Maybe that’s one reason I like Colin Kyo chanters so much, I’ve never had them squeal because of a dry reed or tape on the high G hole (even if half covered). Alrighty, enough of my wandering thoughts. So, we’ve got Jingle Bells because Christmas was 4 days ago, Star Wars because someone asked me for the music and so I listened to some YouTube videos and wrote down the best one, and finally some hornpipes that I thought went well together. Selbie tenors for some good overtone action and a Crozier glass bass for some nice buzz. I was singing a melody to myself the other day and it dawned on me the similarity between it and my recent composition, Burden of Innocence. I was afraid initially that I had totally ripped off some other tune. Alas, I didn’t, but I did spend a few minutes to jot down the other tune from the Battlefield Band recording. It turns out the I was mistaken about being able to compare my blackwood to this brownwood set of Gellaitry bagpipes. It would seem the bushings on my blackwood Gellaitry are about 1/16″ larger in diameter than the brownwood Gellaitry. So, now we’re left wondering what the difference between the woods really is since there is another variable to account for. The plan is to tape over part of the bushings (the holes at the top of the drones) on my blackwood set to see what happens, but that experiment is to come at a later date. 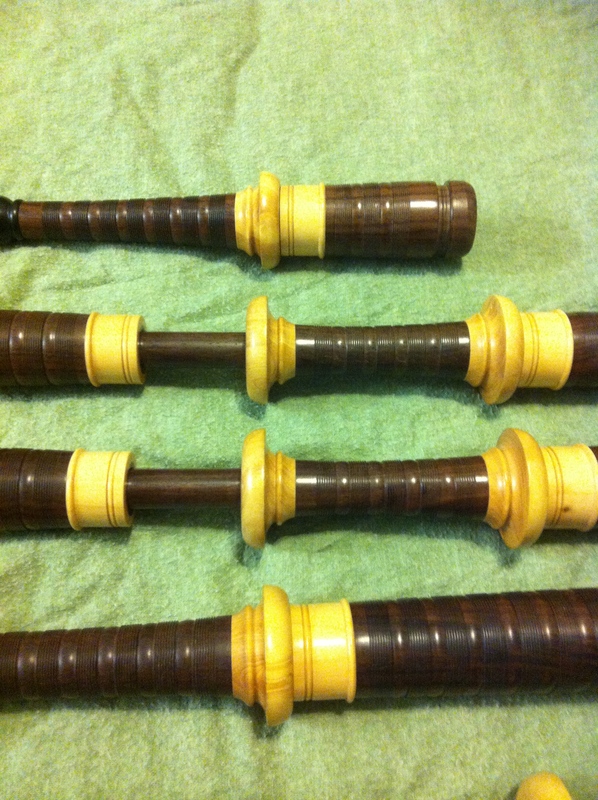 However, I’m currently trying to showcase these brownwood Gellaitry bagpipes. Remember, they are for sale! Tim is just letting me try them out! You know you want them, get a hold of Tim. But first, there is a great website called islandbagpipe.com. 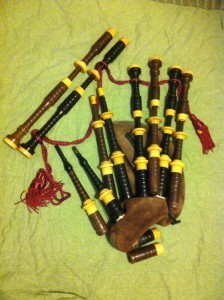 It is home to Island Bagpipe run by Gordon MacDonald, but as a side project he hosts a bagpipe identification site. Gord just so happens to be the only North American retailer of Tim Gellaitry bagpipes, that I know of anyway. He had a set in his shop for a little while and we were going back and forth about drone reeds and he said he liked the Crozier Glass drone reeds in the Gellaitry. I told him I thought they were a bit much, but in light of the fact that my blackwood set is not standard spec Gellaitry (the bushing difference mentioned earlier), I figured I’d give the Crozier Glass another go. It is obvious from the previous post just a few days ago that the brownwood is a little mellower, less edgy, than the blackwood; just enough to take the edge of these Crozier glass which can get a little buzzy in BIG pipes (e.g. D. MacPherson). So, Crozier glass is what you heard above (along with a new chanter reed being broken in that goes a little flat on C and F when I’m not blowing it out) and now below. I think Gord was on to something! Yesterday’s events moved me to write a tune. Still trying to find my words. Colin Kyo chanter, Kinnaird drone reeds (really want to try Selbie! ), Husk chanter reed, Gannaway bag. I never knew how much the tone of a set of pipes was affected by the wood they were made out of until these last few days. Tim Gellaitry sent me a set of pipes made of a brown wood to try because he knows I like to experiment with different setups and wood choice really hasn’t been something I could have studied up until now. I already own a set of his blackwood pipes so I can make a direct comparison between these brownwood pipes and my blackwood pipes. (edit 12-18-2012: I have since discovered the bushings on my blackwood set are 1/16″ larger in diameter than bushings on the brownwood set). Upon receipt, these pipes are very brown. Not ugly brown (a la Pakistani) but instead a pretty brown. 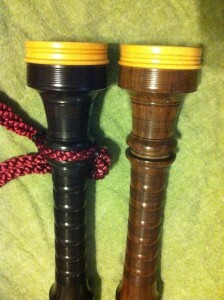 I don’t know the name of the wood, so I’m going to call these pipes brownwood. He says the wood itself is a lot like ebony. I played an ebony set of Robertson’s about a year ago; the first thing I noted in them was the strong overtones and overall sweet sound. 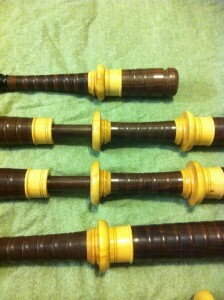 What’s the first thing I noted with these brownwood pipes when I struck them up for the first time? Great overtones and a sweet sound. Relative to my blackwood set, the brownwood set has a smoother sound whereas the blackwood has an edge to it. The difference between butter and its knife. The overtones of the buttery brownwood set are distinct from the edgier sound emanating from the blackwood. So, some recordings. The ONLY thing that changes in the recordings below is the material the drones are made out of (and my chanter kept getting flat after switching to the brownwood pipes so the tuning isn’t spectacular on the brownwood recordings, until the last one anyway). 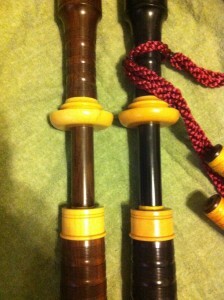 Both are Tim Gellaitry bagpipes made to the same specs. I kept the blackwood stocks, Colin Kyo chanter, drone reeds, bag, actual drone reeds, and relative standing position to the mic all the same. The blackwood ones were recorded first, then I swapped out just the brownwood drones into the blackwood stocks and transplanted the reeds; I never stopped the recorder. 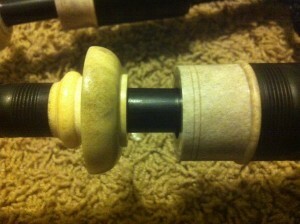 The chanter is tuning fairly high in pitch as it is very dry in Lubbock. I think I’ll pull the reed out a bit and tape the bottom hand for the next round of recordings coming soon to fully feature the brownwood pipes. I use Kinnaird drone reeds, regular pitch. I spliced the scales together here for a more direct comparison. 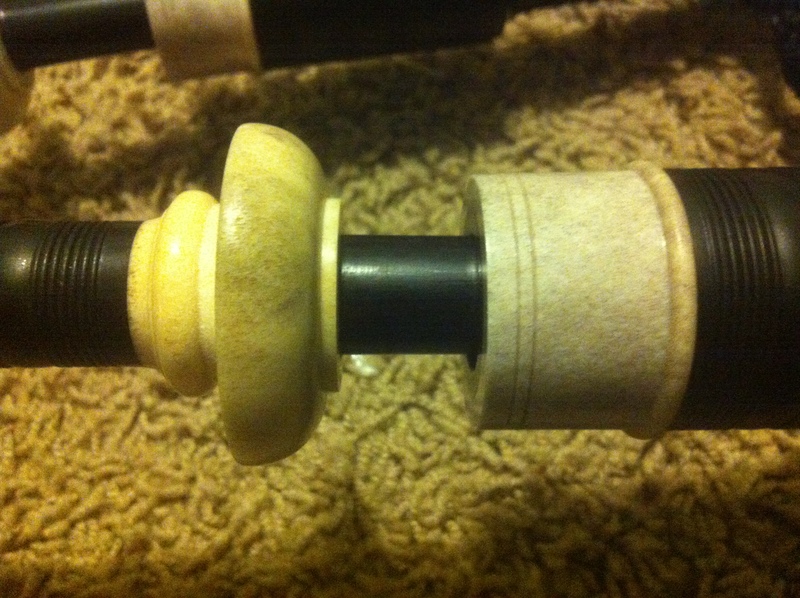 Again, you can hear the chanter has gone a wee bit flat on the brownwood, I had to remember to blow it out. Here are some tune sets. Today was not a birl day, hence the change of jig. By the time I got to the brownwood pipes the chanter started to go flat a little bit, as can be observed in the brownwood recordings above (and mentioned earlier). For my last recording for the day I spent what little time I had left to record correcting the chanter tuning. So, we’ve got a short tunes I ran across in The Gordon Highlanders Pipe Music Collection Volume I a few days ago. Probably my favorite solo piping album of all time is Hugh MacCallum’s. A lot of my original repertoire comes from playing tunes that he played on that album. So I figured I’d play a tune named after him. Stay tuned for the next installment on the blog where I start out with the brownwood pipes so there’s no funny business swapping drones boogering up the chanter tuning. Lastly, I do not own these brownwood pipes, they are just currently in my possession after already being in the U.S. Tim Gellaitry tells me they are for sale. A customer opted to have an identical set but with slides added to the tuning pins, which is what gave me the opportunity to play this other set. 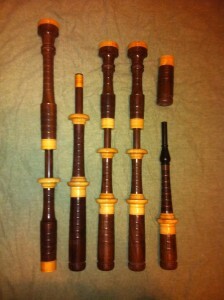 If you’re interested in purchasing these pipes, definitely give him a shout. I have only played the drones and will not be utilizing the stocks or blowpipe. I believe this brownwood set is one of two in existence. Tim mentioned publicly on Facebook (so I have no qualms about reposting it), “it bores and turns very similar to ebony with the dull bores .Very dusty and hard on your tools. 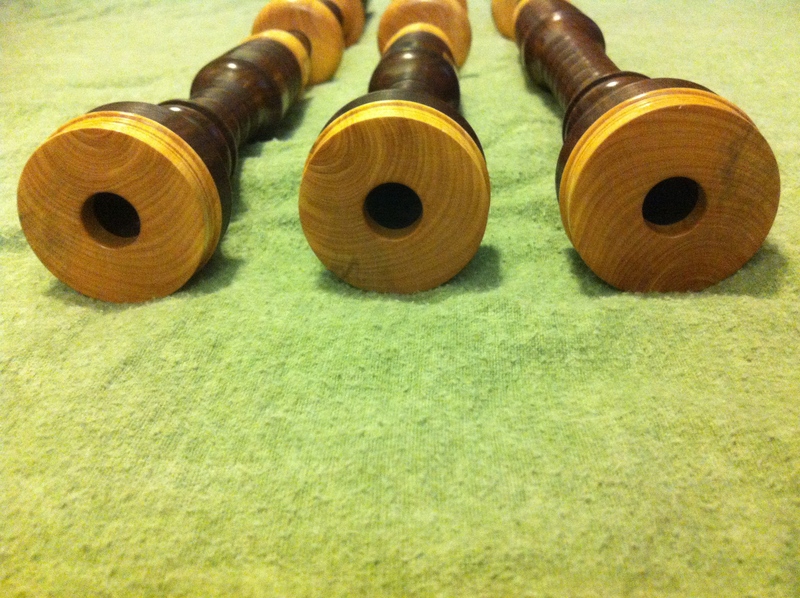 It’s used by a lot of woodwind makers as they prefer the tone.” As I said I own a set of blackwood pipes by Tim (also featured in this post) and they are honestly a great set of pipes. Absolutely top notch craftsmanship (I haven’t seen better) and superb tonal quality. They have been my set of choice for solo competition since I acquired them in 2010. His drones are steady as a rock and sound absolutely fantastic. Finally some pictures! Many years ago, sitting in the passenger seat of our family car, my dad brought up the subject of possible career fields to go into. I wasn’t seriously looking at colleges yet, maybe early teens. The field mentioned as a possibility was chemical engineering, large impact on society and just a little lucrative. I don’t know why the memory stuck in my head. I remember looking at the chemical engineering building at Texas Tech University with the goal to do at least do something productive with my life. A year ago I graduated with my Ph.D. in chemistry (not engineering) from Texas Tech and today I signed a contract for a dual appointment in chemistry (teaching Chemistry II) and chemical engineering (prepping/fixing/piddling around their fluid dynamics lab) for the spring 2013 semester. It has taken a while since that moment long ago for me to make it to the chemical engineering building, but I’m here! So with that sap story comes another one. Today, I’m playing my dad’s old pipes again. I’ve got them set up with a Gannaway bag that’s a little too big (thanks Bryan, better than no bag at all!) and Colin Kyo drone reeds. Same chanter as before. In the vein of recollection, I feature many of the tunes I grew up hearing my father play. I hope you enjoy hearing them from me as much as I enjoyed hearing them from him. First up is a 2/4 march by Pipe Major Robert B. Nicol followed by a reel. The sheet music for the reel my father first worked off of was a handwritten copy from Mike Cusack (former piping director, now school headmaster, at St. Thomas Episcopal School in Houston, TX). I think the march would be a great one for grade 4 solo players. Unfortunately it can only be found in one book that I know of: The Gordon Highlanders, Pipe Music Collection, Volume I. Funny enough, it starts out A LOT like John MacColl’s March to Kilbowie Cottage. Next we have an air my dad used to play along with the jig I named after him, the second or third tune I ever wrote, and one of my best, I think. I say used to play because of course, he has retired from piping, so he’s not dead if you were wondering! I end this post with one more recording of Bryan’s Colin Kyo bagpipes with Canning tenors and a Rocket bass. The post previous to this one was recorded in the walk-in closet as the little people were sleeping, but since they were off at dance class today I get to record in the larger bedroom, so I wanted to give the CK one last airing in a bigger room. As I’m wont to do, I play tunes associated with whose pipes I’m playing, so this time we’ve got Bryan’s competition MSR. 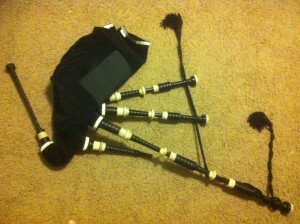 My friend stopped playing his Colin Kyo bagpipes long enough for me to have a crack at them for the blog. We were running all Canning (old worn out ones) but the bass reed fell in the bag like, I don’t remember how long ago at band practice, and I didn’t notice until I couldn’t blow up the bag that my friend hadn’t fished it out yet (tsk tsk, I can’t get the middle tenor out either, it’s spinning in the stock, tsk tsk). So the Canning carbon bass is not acting right (maybe got a bit of seasoning on it?) so I’ve got a Rocket bass in there now. Anyways, the Canning in the tenors are the important part. Good volume on the overtones but not harsh, which is nice. There are some crazy harmonics going on on B and especially low G, listen for it! I am sorely out of practice, if you hear any spitting in the last track due to loss of lip seal, DANG IT, the microphone picked it up, lol. So, like the idiot I am, I figure I’m out of practice, so I should play fast tunes. Duh. The first set the drones start out all right but then go out a bit as I’m getting warmed up still, so I recorded it again but at the time I was trying to fix the D tuning and forgot about the drones. So…here’s the first set of tunes twice. The first one the drones are in tune (at least at the start); the second one the D is in tune (I think). Then I tuned my drones ;o) and played some jigs. I was digging through “Gordon Duncan’s Tunes” and ran across Rory Gallagher which is a neat tune; I don’t play it like it is written but how I remember hearing it on a World’s album from a while back. That’s followed by Rob’s Shower Shabang by Murray Blair, a tune I learned a long time ago and played with a fiddler friend and then again I played it with Lyon College as it was in our Medley at the World’s in 2001 (2nd grade 3B). Lastly, since these are my friend’s pipes, I played his favorite jig o’ the day, Leisa McCord by Ebert (better known as EJ) Jones. Lastly, I figured I better play some slow stuff so you can hear the drones better so here is a waltz that I learned off of EJ as he plays it on a Clandestine album (I think I have the title right?) followed by a waltz written by myself which really doesn’t go too well with the first one, and then I finish with a jig I wrote after I remember how it goes. 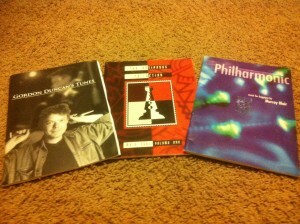 To conclude, below are three great books that you should definitely have in your collection from which a lot of the tunes I played in this post can be found. To actually conclude, here are some pictures of the pipes I was playing. Drool away! Why yes, it is fully mounted in moose antler. Jeffers pipes + Atherton chanter + new 6/8 March! This is just a quickie since it’s been so long. A quick tune up of the Atherton chanter (Husk reed) in a new set of Keith Jeffers’ pipes in cocobolo (Selbie reeds) to introduce a new tune (sorry the E is a little off). I’m a big fan of Battlefield Band. The pairing of non-bagpipe instruments with pipes really brings the pipe tunes to life and they always have great musicians that make it just sound great. An older album of theirs, “There’s a buzz” has quite a few traditional pipe tunes that can be found in the old collections, most available via ceolsean.net. One of my favorite tunes on the album is a 6/8 called the Quaker. So, I made my own arrangement from the ceolsean versions paired with what’s on the album. Below it is played with Mrs. Lily Christie to start. Also linked is the YouTube video to stress how important having decent audio equipment is. It is the exact same recording. The MP3 was done with a Zoom H2, the YouTube video with my iPhone. No, YouTube isn’t that bad, it’s the iPhone.